I began profiling photos of chairs I found on the streets of cities that I lived in or traveled to in January 2011 on CoLab Radio, and then other individuals started contributing their pictures too. Because CoLab Radio was able to collect so many beautiful images of street chairs from all over the world, our first instinct was to curate a traditional photography exhibition for a larger audience to see. As I was brainstorming a low-cost way to do something more with these chair photos and engage the photographers who contributed, I learned about the Knight Foundation’s Random Acts of Culture initiative, which funds flash mob performances of professional opera, dance, theater, et cetera in public spaces throughout American cities. The concept is to bring the arts to the masses and profile videos of these surprise pop-up events on the Internet for others to enjoy. I thought, why not do the same with still art and use the pop-up show model to build community among CoLab Radio bloggers, photographers, and friends? The idea was simple: print the chair images poster size and mail them in tubes to different CoLab Radio members around the world. Each participant hung their poster in a public space and documented the installation via photo and video, which I profiled on CoLab Radio. These posters were accompanied by a QR code so onlookers can access the blog series with their smartphones, as well as information to send their comments and get in touch via twitter. No photographer received his or her own chair photo in the mail. For example, New Orleans got a chair photo from Jodhpur, and Mumbai hung a chair photo from Boston. 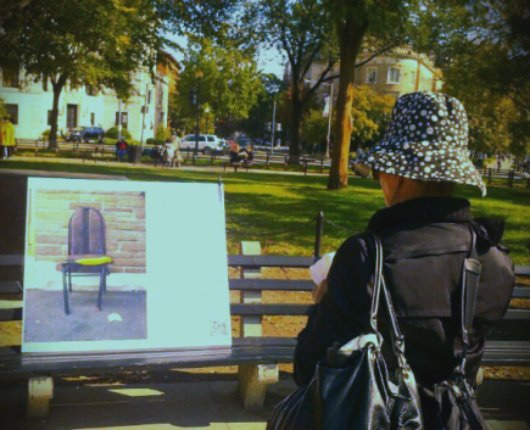 Forty participants hung chair posters in 25 cities. The International Street Chair Pop-Up Show was also featured on CityLab, Fast Company, and Next City.